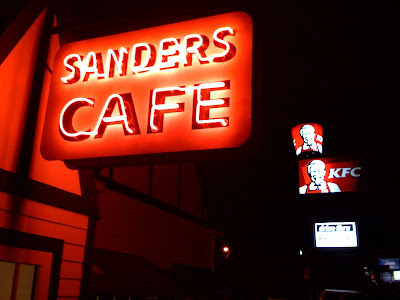 While on recent trip to southeastern Kentucky I had the opportunity to stop at Sanders Cafe -- the site where Colonel Harland Sanders developed the recipe and process for his Kentucky Fried Chicken now famous the world over. The original restaurant site in Corbin, KY holds an operating KFC restaurant (one of the 14,000+ now operating in over 80 countries) and a museum. It is a little off the beaten path, in fact the routing of what became Interstate 75 outside of Corbin diverted travelers away from Sanders' restaurant and led him to explore a franchised business model. If you're like me you've probably heard about the secret recipe of 11 Herbs & Spices, but didn't know about the second part of the Colonel's innovation: pressure frying. It takes 30 minutes to fry up a fresh bird in the skillet, too long of a wait even for weary travelers in the 1940s. Deep frying is a much shorter alternative, but yields a different tasting product. Pressure frying (similar to pressure cooking) uses high heats and pressures (but not oil immersion) to reduce the fry time of the bird and yield the characteristic taste. My Kentucky hosts told me about the Annual World Chicken Festival held each year in the neighboring city of London. This year will be the 20th festival and held September 24-27, 2009. A key feature is the 10 ft diameter skillet that can fry 600 chicken quarters simultaneously. Maybe I will be lucky enough to be back in town?